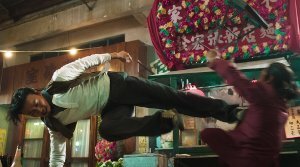 Story: After Cheung Tin-chi (Max Zhang Jin) lost his fight against Ip Man behind closed doors, he gives up his Wing Chun school and is for hire as a brawler, who just takes action against gangsters, though. But soon he doesn't want to have anything to do with that either. He wishes for a simple life for his son and himself and opens up a small shop. One day, however, he witnesses how the singer Julia (Liu Yan) and her sister get attacked by the gangster Tso Sai Kit (Kevin Cheng) and his gang. He defends them and everyone involved in the situation is taken to the police station. But Tso and his gangsters are quickly released again because apparently they have the police captain in their pocket. Tso takes revenge on Cheung by setting fire to his shop while he and his son are locked inside. Cheung barely manages to escape the fire with his son, but the police simply files this incidence as an accident again. For that Cheung takes revenge on the opium dealer Tso. In the meantime, Tso's sister Ngan Kwan (Michelle Yeoh), who is the head of the organization, tries to perform damage control, because she actually wants to turn her business into something legal. But her brother is still willfully obstructive and with the restaurant owner Owen Davidson (Dave Bautista) he now has a new boss for whom he deals with heroin. 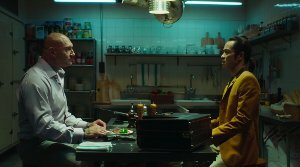 Since Chinese people have almost no say in the British colony and the police doesn't take care of the accusations against Tso and Owen, Cheung has to take care of justice himself. 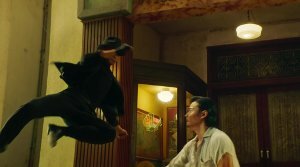 Review: Fans of the martial arts genre can bridge the waiting time until "Ip Man 4" comes out with spin-off "Master Z". 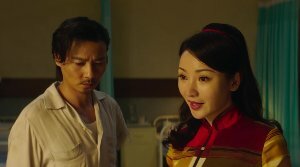 But even by itself, the movie is rather promising as Max Zheng (aka Zheng Jin) reprises his role from "Ip Man 3". The fact that he is an impressive martial artist should be well-known since "SPL 2: A Time for Consequences" at the latest, a movie in which he takes on Tony Jaa - a fight which gets a continuation a few minutes into "Master Z". But the movie struggles with some weaknesses. Even though it is nice to feel thrown back into the 90s, during which all foreigners in the British colony were villains, this is mostly stereotypical and comes across almost ridiculously. 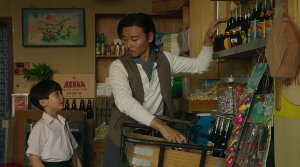 In addition, even though wire-fu was also part of the "Ip Man" franchise, the amount of it used in this movie is a little bit annoying. That extra 90s flair is also created by the fact that almost all exterior shots were done on a big set, an entertainment street in Hong Kong. Next to that there is a gangster organization, who has full control of the drug trafficking, and a lonely hero, who does not want to fight anymore but - given the injustice around him - feels obligated to do something. Surely, all this is nothing original, but there are also some attempts to make the plot a little bit more complex. Therefore, the supposed villain, played by Michelle Yeoh, turns out to be a woman who wants to distance herself from the illegal businesses of her family and tries to steer her enterprise in a more legal direction, even if her brother always thwarts her plans - a complicated relationship. 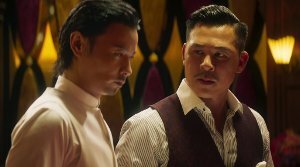 Therefore, Tso seems to be the real villain of the story, but this turns out a little anti-climatic as he comes across more like a petty crook, who wouldn't stand a chance in a fight against Cheung. 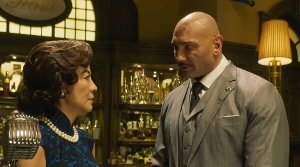 Amongst all the stars of the cast, there is also ex-wrestler Dave Bautista ("Guardians of the Galaxy"). His character seems rather loveable and charismatic at the beginning, which is pretty irritating because there is no doubt that he has to be the big bad gangster boss against whom our hero has to use his Wing Chung tricks to make up for the physical disbalance of power. In the end, everything turns out as expected and Owen proves to be a scrupulous gangster. Then, there is the police with the corrupt British captain as a leader who does everything Owen wants. The injustice and helplessness of the Chinese against the superior colonial power had already been a huge topic in Hong Kong movies when it was a current issue, therefore this just seems as a rehash of well-known scenes. Especially, since filmmakers could already operate a little bit more subtle in the 90s (but admittedly they did not all too often). The story has some twists and thanks to a variety of characters friendships and enmities are constantly forming so that everything seems rather complex in the end. 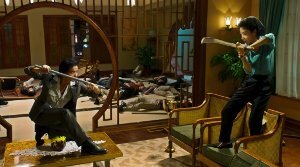 One could argue that with the countless characters the movie might seem a little bit cluttered, but most of the time, everyone knows his place and - except for the aforementioned question about who the real gangster boss is - the central theme of the story remains clear. 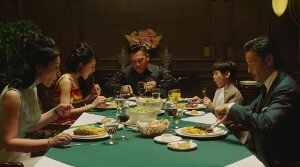 Despite some detours, the story never really gets confusing as most viewers of Hong Kong cinema know their way around stories like that. But that can also be seen as criticism, because there is nothing really new or original happening here. Nevertheless, this might also be okay because you are mainly watching for the martial arts fights anyways. Those are well-choreographed which shouldn't come as a surprise since veteran Yuen Woo-ping is responsible for the fights. However, in a movie like this, you would have wished for more down-to-earth fights. There is too much wire-fu going on and in one sequence the characters start climbing up the neon signs of the streets and you get the impression that gravity has ceased to exist completely. The final battle against Dave Bautista is actually pretty satisfying, but since it ended up being comparatively short and the movie even keeps going after that, "Master Z" lacks a real showdown. Maybe the real showdown is Max Zheng's confrontation with Tony Jaa or the fight against Michelle Yeoh, who can show off her skills with a saber once more. Martial arts fans will not be disappointed, but the movie could have done more, especially more Wing Chun. "Master Z" doesn't get boring, the story always moves along, but it is simply lacking originality, even in its execution. Similar to his work with "The Thousand Faces of Dunjia", Yuen Woo-ping cannot really convince as a director anymore.